Missionaries and former pastors of the Munakata Bethel Christian Center on the island of Kyushu, JAPAN. Nils & Andrea OLSON married in 1976 and left for Japan in 1978 as ordained missionaries out of Seattle’s Bethel Temple. They went directly to the southern island of Kyushu where they began learning Japanese and the “ropes” of missionary life under the supervision of an already-established local Japanese (Bethel) church. After four years, in 1982 they stepped out on their own and began pioneering what is now the Munakata Bethel Christian Center (MBCC). Munakata City is a “bed town” of 96,000-plus people located between two metropolises (Kita Kyushu City to the north, and Fukuoka City to the south) of over one million each. The work began in their rented house, and when it became too small, the church moved to a rental facility. After being there for several years, they were asked to move. Nils & Andrea were led to lease a piece of property and build a permanent structure in the city. In 1993 the permanent building was completed, debt free. The church has been a place of gathering not only for worship services, but for different community-related functions such as English lessons, weddings, funerals, chapel concerts (including gospel, opera, classical Japanese instruments, etc.) potlucks, recitals, flower arranging, crafts and sewing circles. The church has developed into an active group of believers being governed by the Holy Spirit and a solid-faith group of elders and deacons, presently being overseen by Pastors Jim & Tracy XAVIER. Nils majored in Radio-TV communications with an emphasis on TV newscasting and had fully intended on following that career. However, in 1973 he was led to enroll in the (then) Bethel Temple Bible School and begin preparing to become a missionary, which is what he desired to become when 12 or 13 years of age. Even though he changed fields, he finds himself doing exactly what he studied in radio-tv newscasting so many years ago. Besides weekly preaching and teaching, he is actively involved in performing wedding ceremonies for many, many Japanese couples who desire to be married in the atmosphere of a genuine Christian church by a genuine pastor. He orientates the couples using Biblical principles of marriage several weeks before the wedding. Almost 99% of those attending the wedding have never set foot in a church before. Andrea, an Alutiiq Alaska Native from the Prince William Sound, graduated from high school in Cordova, AK, and enrolled at Seattle University to study nursing. After graduating as a qualified RN, she began working at Doctors Hospital on what nursing students of that day referred to as “Pill Hill” (Capital Hill) in the downtown Seattle area. She continued her work there for a couple years. In May of 1973, she gave her heart to the Lord and enrolled as a first year student in the (then) Bethel Temple Bible School. You can read more about how she and Nils met in the chapter titled “I wanna be a missionary when I grow up” in his book My Chapter Of The Story. Andrea is compassionate. She works well with women in the church. She loves young people and will always encourage them in their walk with the Lord. She prays. She prays for her children, both her own and the ones God has given her to mother in the church. God hears mothers’ prayers! July 1977 — Ordination, Bethel Temple, Seattle, WA (Missionary/Pastor) Both Nils & Andrea carry permanent credential cards from Bethel Fellowship International. 1982 2016— Munakata Bethel Christian Center established. From 1982 to Nov. 2016 Nils & Andrea pioneered-pastored the Munakata Bethel Christian Center. 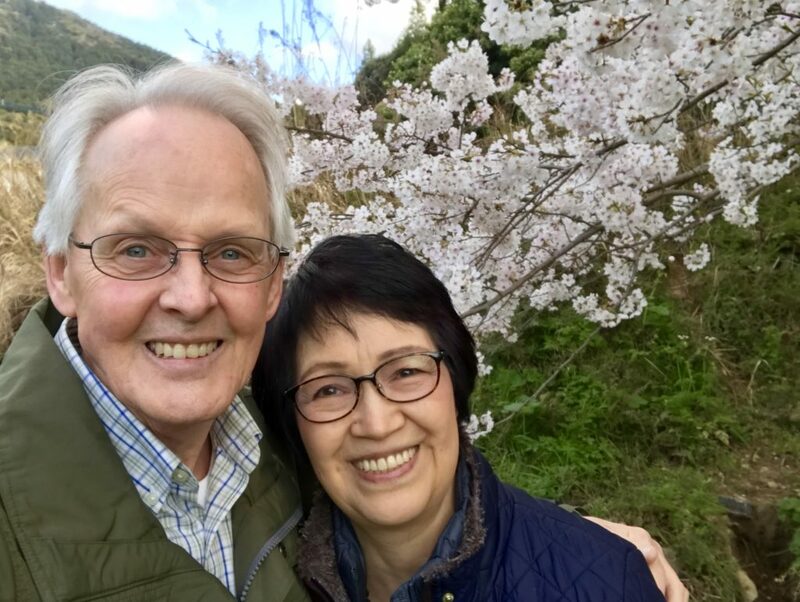 They are now semi-retired but find themselves still busy working in the vineyard of the Lord, ministering monthly in a small church on the island of Yakushima in southern Japan, performing weddings, and supporting the church they pioneered almost 38 years ago. They reside in Munakata, have been married 43 years, have three children and seven grandchildren. Lisa Graham was seven months old when we arrived in Japan. Currently living in Fife, WA and attending Bible Fellowship (pastored by Jeff & Cheryl Earlywine) where she and her husband, Danny, are active deacons and youth pastors. Danny & Lisa have three sons. Mark was born and raised in Japan. Bilingual (English-Japanese) fluency, currently living in downtown Fukuoka City, Japan, and is self-employed as a translator-interpreter. Graduated from Hawaii Pacific University in May 2002. Mark is married to Megumi and they have two children. Caroline Spingath was also born and raised in Japan. Bilingual (English-Japanese) fluency, graduated from Hope International University in Fullerton, CA in 2007, majoring in music. She and her husband, Jeremy are living and working in Lake Stevens, WA. Jeremy and Caroline have written and produced a few recordings, as well as being active in their local church. They have two children.